But this is not a post to apologise for that, we all have our sewing ups and downs…this is a post about actually sewing. It all started with a phone call from Kat at 4pm on a Saturday. We chatted about a lot of things and, of course, sewing. I complained about my low sew-jo and how I really just couldn’t be bothered right now…even though I have 4 projects already cut out. We talked about what inspires us to sew and I mentioned how I had a lot of fun sewing the dresses for TMS Frocktober 2014 because I was actively photographing them to share later. 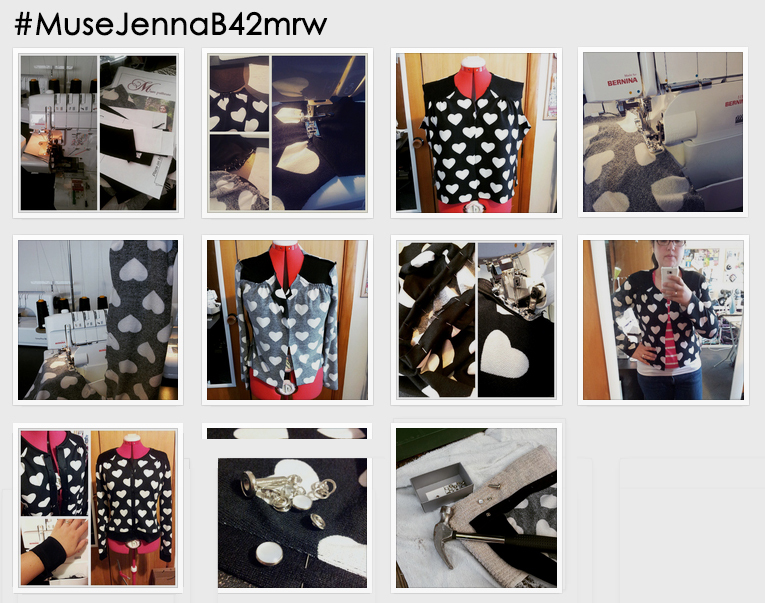 Kat said just recently she had really enjoyed Instagramming her Hummingbirds Clover dress progress and got a lot of fun and encouraging comments along the way…and that’s how #MuseJennaB42mrw started. I got as far as neckband before I stopped for dinner. Then I finished up to the cuffs before I realised that I better choose some buttons. Nothing in my stash did the trick so I decided to go with pearl snaps. They play in with the slightly vintage vibe of the pattern and my fabric choice however by the time I dug them out it was dark and a little bit too late to be outside sewing with a hammer. On Sunday morning I attached the snaps and then I was all done. The arms are a teeny bit long so I’ll adjust those next time my overlocker is threaded up black…and it’s just as comfy when buttoned up. It’s such a fast make because I stitched about 90% of it on my overlocker, only using my sewing machine for the shoulder yoke gathers and the top stitching. Muse has 4 patterns published now and considering it’s the creative child of one of my BSFF (Best Sewing Friends Forever) I’m a little embarrassed about how long it’s taken me to actually stitch something up. I wanted this post to be a bit of a review of the experience…except that hasn’t happened! 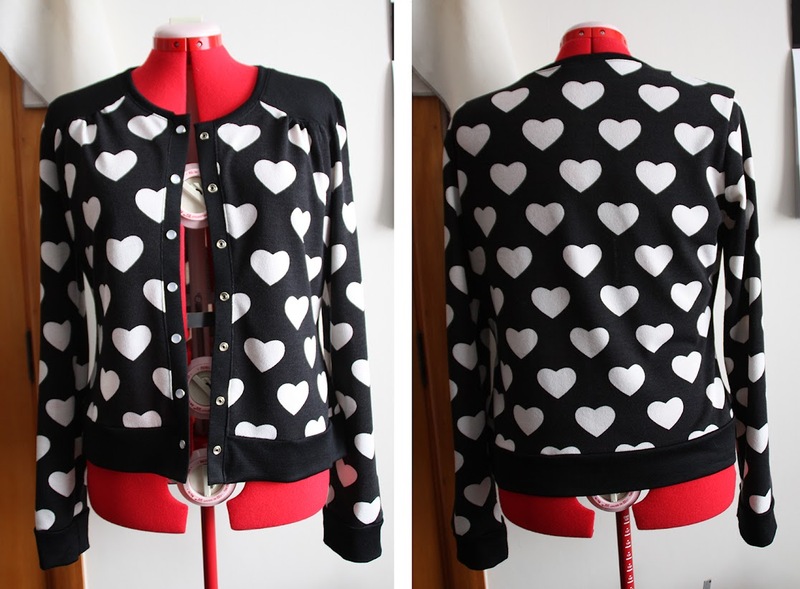 The hearts are some sort of poly knit from The Fabric Warehouse but the black contrast is merino from my stash. So this is a good time to mention that my favourite merino source is now online. Levana is merino heaven! So if you’ve been coveting some soft and warm NZ Merino then you’re in luck. Shipping within NZ is pretty reasonable and they will ship internationally, you just need to email them for a rate first. They will be adding more of their fabric range to the online store shortly. Next time I will shorten the arms about 2cm. Fabrics – Poly knit: The Fabric Warehouse, $16/m. Black contrast: merino from stash. I’m not normally a fan of cropped…anything…but I think I need to make the waist length version next to wear over some of my dresses come winter…but first I’ll sew up the Gillian dress, one of the other projects I already have cut out. 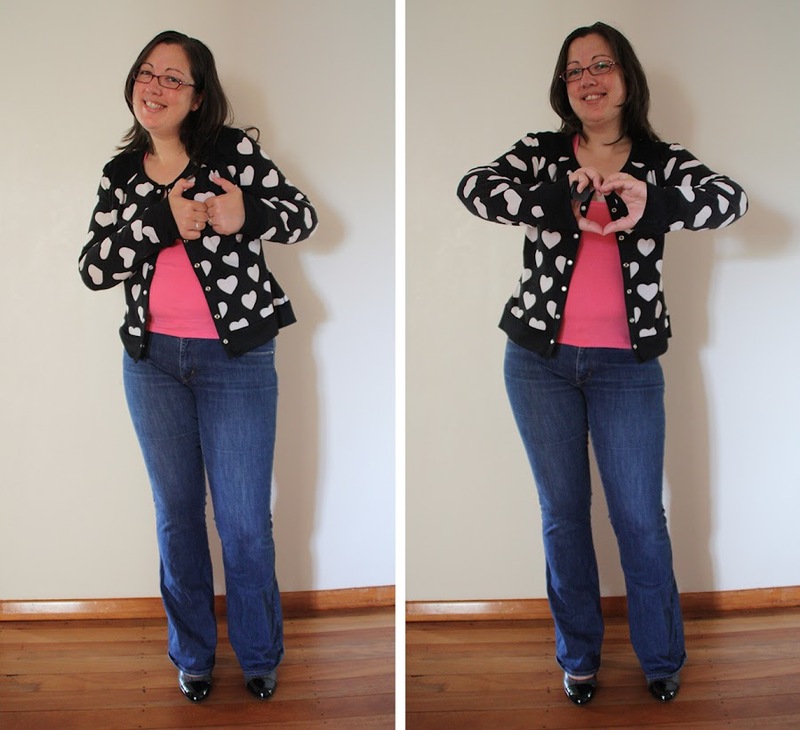 This entry was posted in Sewing Projects and tagged Jenna Cardi, Muse Patterns, Sewing Muse by thecuriouskiwi. Bookmark the permalink. Great cardi, the fabric is so cute and I really like the black contrast yokes. It’s a bonus that you managed to make it in just a few hours. That looks lovely. It’s cosy and cute as a button. And I’m ever so slightly relieved to see you blogging again, even if I somehow managed to not see it for a couple of weeks.